msd mouse reference: Gow A, Southwood CM, Lazzarini RA. 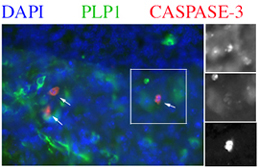 Disrupted proteolipid protein trafficking results in oligodendrocyte apoptosis in an animal model of Pelizaeus-Merzbacher disease. J.Cell Biol. 1998 Feb 23;140(4):925-34. Samples were loaded onto a 12% separating gel. After transfer, blots were blocked in 5% milk for 1 hour; primary antibody (rabbit anti-Caspase-12, 1:3000, RA15048) was added in 3% milk and the antibody was allowed to bind overnight at 4C. After washing 3 times in 1XPBST (10 mins each), a secondary antibody (goat anti-rabbit IgG-biotin, 1:2000, Southern Biotechnology Associates, Inc.) was added for 1 hour at RT. 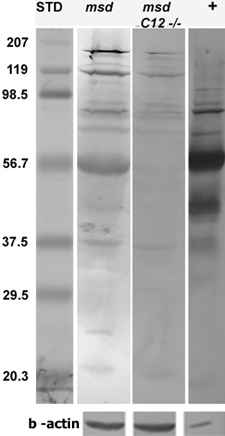 Blot was washed again in 1X PBST for 3 times (10 mins each), followed by the addition of tertiary antibody (SAV-Alkaline Phosphatase, 1:2000, Jackson Immunoresearch Labs, Inc.) in 3% milk for 1 hour at RT. After washing 3 times in 1X PBST (10 mins each), the blot was rinsed in 100 mM Tris, pH 9.5 and substrate (NBT/BCIP, Roche) was added. The blot was stripped and reprobed for b-actin (Sigma, cat# A1978). Dr. Yuan kindly provided the Caspase-12 null mice. Data Courtesy of Ramaswamy Sharma and Dr. Alexander Gow, Wayne State University.